PRODUCT: HEAVY DUTY FIXED-BLADE UTILITY KNIFE WITH ALL METAL BODY. INCLUDES BLADE. PRICE/EACH. DESCRIPTION: Die-cast metal, industrial quality, economically priced. Durable handle with blade storage. Comes with 1 blade. 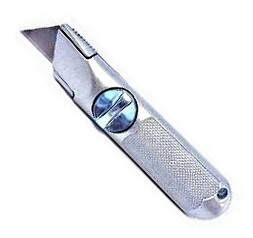 Heavy-Duty All-Metal Retractable-Blade Utility (razor) Knife. Includes One Blade. Price/Each.